Children love tracing. Even very young children show concentration and focus when tracing objects, lines, numbers and letters. 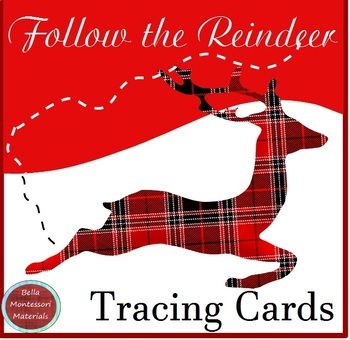 This file is extra special because the curved lines follow along behind a tiny reindeer! Just print, cut and laminate. Could you please take a few moments to click on the green star beside my store's name? That makes you a follower and you will know as soon as I put new work up. I usually discount the new work for several days.